There wasn’t any doubt that the ruling African National Congress (ANC) would win the fifth post-apartheid election in South Africa’s history. But relatively poor showings by South Africa’s various opposition parties seem to have failed to hold the ANC under 60% of the national vote, with the party set to enter its third decade in power. Under the leadership of Nelson Mandela in 1994, the ANC rose to prominence after a decades-long struggle against white minority rule, and its political dominance hasn’t seriously been challenged at the national level in the past 20 years. That’s despite growing malaise over economic conditions, income inequality and mass unemployment. 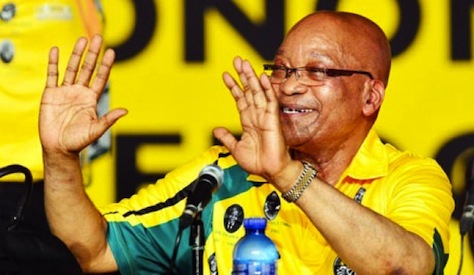 That’s also in addition to growing concerns about corruption under the leadership of president Jacob Zuma (pictured above), who will now be reelected to a second term once South Africa’s newly elected National Assembly convenes later this month. Notably, the election was the first to include the votes of the ‘born-free’ generation, South Africans who were born after the end of the apartheid era. It was also the first election held after Mandela’s death last December at age 95. Voters in South Africa yesterday elected all 400 members of the National Assembly and the governments of all nine provinces. 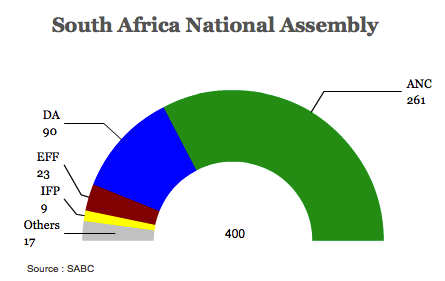 With just over 85.5% of the votes counted, the ANC led with 63.04% of the vote. The opposition Democratic Alliance (DA) was winning 21.84%, its highest vote total to date. 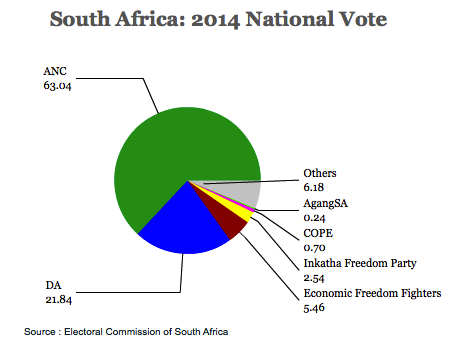 In third place was the newly formed Economic Freedom Fighters (EFF) with 5.46%. Its leader, Julius Malema a former ANC Youth League head and a one-time Zuma enthusiast, was kicked out of the ANC two years ago, and he’s campaigned on a neo-Marxist platform of widespread land redistribution to black South Africans and nationalization of key South African industries, including mining. RELATED: Who is Julius Malema? So for all the hand-wringing over the corruption, a deadly confrontation with striking mineworkers, the tension within the ‘tripartite’ alliance among the ANC, the South African Communist Party and the Congress of South African Trade Unions (COSATU), the ANC will hold almost exactly the same number of seats in the National Assembly that it held prior to the elections. It’s been a busy season for politics in the Balkans this year — Croatia began the year for the first time as a member of the European Union, Serbia’s snap elections in March returned a resounding victory for Aleksandar Vučić and his center-right Progressives, protesters in Bosnia and Herzegovina are calling for new conditions to longtime economic and political stagnation, and Macedonia’s center-right government recently won a fourth consecutive term in power. Alenka Bratušek, the country’s first female prime minister, resigned on Monday, calling into question whether the shaky Slovenian economy will avoid an international bailout that Bratušek worked to avoid in her 13-month government. Bratušek’s resignation follows internal upheaval within her own party, Pozitivna Slovenija (Positive Slovenia), still a relatively new center-left political party. With voters fed up with the two dominant parties, Positive Slovenia burst onto the political scene in the most recent December 2011 parliamentary elections. It won the largest bloc of seats (28) in Slovenia’s 90-member, unicameral national assembly, the Državni zbor. In the 29 months since the last election, Slovenia has now had both a center-right coalition government and a center-left coalition government, and both have fallen. 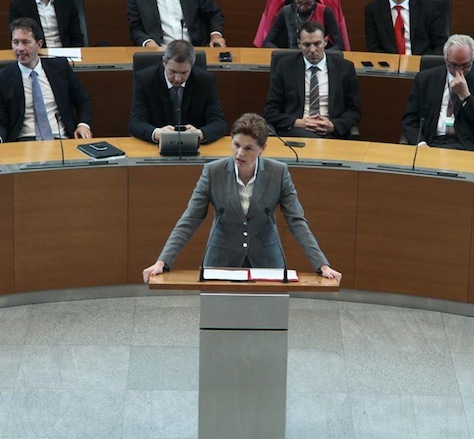 That means that Slovenia likely faces snap elections this summer or early in the autumn, and Bratušek, 44, has suggested that she will form her a new party of her own to contest to them. Bratušek (pictured above) was never the driving force within the party, however, whose founder is Zoran Janković, a former retail businessman who served as the mayor of Ljubljana, the Slovenian capital, from 2006 until 2011, and against since 2012 following his failure to become Slovenia’s prime minister.